We all want to reduce our carbon footprint…right? Well when you live like we do here in our little humpy, the usual advice doesn’t always apply. 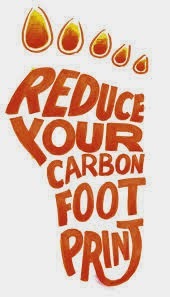 What do we do to reduce our carbon footprint? We use solar power only, no grid electricity. We do use a generator once a week though. We collect all our own water via a roof and tank system, we use very little fuel to pump the water up to a header tank to supply the house via gravity feed. We don’t buy anything we don’t need and all our groceries come from the local Co- Op. We have a vegetable garden, which could be better but I’m working on it. I don’t drive, I go everywhere on the local school buses or car pool. My partner does have a car for work though. We sort our rubbish carefully and reuse everything we can and recycle everything we can. Making eco bricks with soft drink bottles and plastic rubbish has been a big step forward in this area. So has our use of old tyres for construction materials. My partner has a four wheel drive for work, it uses a LOT of fuel in the course of his working week; we do need to invest in a more fuel efficient vehicle so he can go about the countryside saving carbon (he installs solar electricity systems) AND producing less carbon. I wish there was a work horse type vehicle available in an electric option with a range greater than 200 km. At the moment we use gas for refrigeration, I would like to change this to an electric fridge (and I dream of a freezer) but that will require double the solar panels we have now, a new set of batteries and maybe a new inverter (the thing that changes 12 Volt power to 240 Volt power). We run our generator on petrol; it is used once a week for four hours to charge the batteries (just an extra boost) while I do the washing as the washing machine uses too much power to run on solar (although a bigger inverter would fix that problem). To get away from this fuel use we would need to either upgrade our inverter or build/buy a hand operated washing machine. I am swayed towards building a hand operated machine myself, but like all hand operated things it needs more time to do things that way. Maybe when I am finished studying…. What else can we do to reduce ours? Ideas welcome.